Teachers throughout the globe often struggle to supply their students with the proper tools needed to achieve a good education. Many schools in the United States have been experiencing some major budget cuts. This has resulted in many teachers losing their jobs. Those teachers that do remain have a much heavier load to carry. Larger classrooms mean busier teachers. Sadly many teachers often reach into their own funds to provide supplies for their classroom, however, it is at the point where they can no longer afford to so because of less pay. Of course it's the students who suffer the most. The world and education is progressive and without the needed tools students will not advance and meet their full potential. It is a sad situation. Del Monte recognizes the struggle of teachers throughout the world and is providing an opportunity to help with needed supplies. Thank you Del Monte! Del Monte also recognizes a second struggle, and that's getting kids to eat healthy. Recognizing these Two needs Del Monte is hosting their second annual Del Monte's "Teacher Monday": Cash for Classrooms. Teachers throughout the U.S., Canada and Central America can enter to win cash for school supplies as well as fresh fruit for their classrooms. Sixty teachers will win a total of $1,000 in cash to purchase school supplies and fresh fruit for their students. Top winners will also get a Del Monte FreshÒ Field Day event for their school in which the entire student body will enjoy a day of Del Monte fresh fruit, games and fun activities. Salad bars for schools will also be given away through promotions at supermarkets. Go to www.fruits.com for more details. Students also have the opportunity to vote for their favorite teacher on a daily basis. The voting begins on 9/26. Schools located in Del Monte Fresh Produce’s tropical growing regions; Costa Rica and Guatemala, will also receive grants for school supplies. To spread the word the generous folks at Del Monte are offering three of my readers $25 dollars in free fruit and/or vegetables each. Each winner will receive five $5 gift certificates; totaling $25, that expire on 4/30/12. The first winner drawn will also receive a back pack filled with school supplies. Cool right?! Our teachers are wonderful and with all the budget cuts need all the help they can get. Thank you Del Monte for helping out. we have major budget cuts in our districts, but most of the school supplies shouldn't fall on the teachers! Great giveaway, thanks for the opportunity at a great prize! Great giveaway. Love Del Monte Pineapple and love they are promoting this to teachers/schools - healthy eating. This is a great thing they are doing! Great giveaway, thanks for a chance to win! This would come in super handy for the back-to-school year! That is a wonderful thing for teachers! They very much deserve it! love that they are helping out the teachers. GFC follower.Thanks for the chance. I'm always ready to help out the schools!! This definitely makes me think more positively of the Del Monte brand! Woo Hoo for Del Monte! 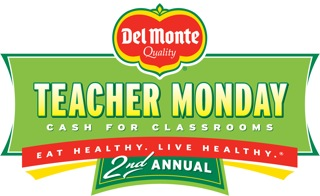 What a great thing for Del Monte to do for teachers. My sons teacher for 1st grade is just the best!!!! to say the least..She has helped him reach new levels of learning..So thank you!!! This is a great idea! Thanks Del Monte! Kids never eat enough fruit so It is awesome to see that they will.. Thanks for the great giveaway! I love fruit!! Good for Del Monte! It's nice to see them helping out. And look it didn't take a government coercion to make it happen. Love that they are pushing healthy lunch choices! Lets get healthier food into our schools! Honestly what's on my mind is that I'm tired. Lol. This is a great giveaway though. Thank you so much. Great giveaway!!!! We love Del Monte products!!!! I'm glad Del Monte and so many other companies are reaching out in a time when many schools are hurting. Thanks! I love Del Monte, and it's nice to hear companies helping out like this. Thanks for the great giveaway - I'm all for everyone eating healthier! Thanks for the chance! We LOVE Del Monte! My kids would love more fruit with their meals. I'd love to win this - it would really help get healthy fruit for lunchboxes. It sickens me to see how restricted our grandchildren's school districts have become. Every bit helps and these programs help alot. I like to see companies, like Del Monte helping our schools. They certainly need the help. Great giveaway! 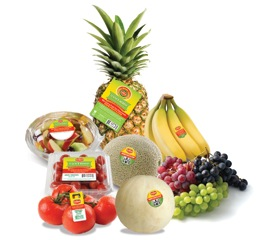 We love Del Monte products! What a great way to help get fresh fruits and vegetables. I noticed something odd on the twitter tweet links you have, for some reason in on twitter WOT gives them a red flag, but when going to a page they do not have one. Almost made me didn't post any tweets on contest because I thought it was a bad website. I am a new follower and so happy to have found your site! Thanks for the chance! The Del Monte fruit will be great additions to my children's lunch boxes!